Let the assault commence with one of America’s rising Death Industrial/Power Electronics latest sources of relentless torment. The title track of this album and the following ‘Damnatio Memoriae’, sum Nyodene D up in one fell swoop. With an old school aesthetic that is as brutally punishing as it is absurd. Echoing machinery is crushed to pieces in an unrelenting barrage of white noise, whilst tormented and ravaged vocals struggle to force through the mix. ‘Edenfall’ in itself is a ferocious slab of prime violence that seeps through to the core of the listener. Occasionally, restraint is thrown into the pot, but remains ever threatening and horrific, much in the same way IRM channel this medium. As an entire release this can be a little too much to stomach. In a way this is entirely what any subscriber to PE should relish, as there is more than enough here to mirror extreme internal rage on the highest level. For myself however, I do like it when there is a little more rhythm in the pot and ‘Edenfall’ would benefit from the squelching sounds being cultivated a little more into something to get the heart stuttering and fists pounding. Accompanying this album is a 5-track EP of sorts, in collaboration with label mate Sektor 304. 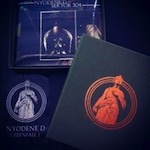 The album ‘Edenfall’ is available separately or in a gloriously foil embossed box set with this second CD. What we have here is a perfect partnership of like minds. 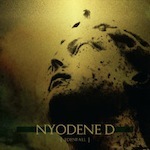 Tracks 1, 3 and 5 are three entire new songs created from sound sources take from ND’s ‘Edenfall’ release, whilst tracks 2 and 4 are Nyodene D creating new songs from some of 304’s own work; not entirely new, but neither are these straight remixes. For me, this is where Sektor 304 shows who is boss. I enjoy the projects own work immensely and the key output comes from ND’s partner in crime The ambient hums and clattering’s of noise sculptured into something a little more cohesive in nature, as opposed to the all out throttling provided by the evidently more visceral ‘Edenfall’. My recommendation would be to hunt down the box set as opposed to the sole album, if anything, to provide a little more variation.